This page contains some comments about virtual earth products that are currently available. The comments are mainly limited to those issues that are relevant to this site. They should not be regarded as general reviews. See also my Screenshot Comparisons Page. To summarise: I would like to have an earth viewing service that will both (a) show me a high resolution image of my home (note to Google and NASA: it's at 56�20' N, 3�15' W) and a decent 3D image of Mount Everest (note to Microsoft: it's at 27�59' N, 86�55' E, on the Tibet-Nepal border). Note: The paragraphs that follow contain several links to Wikipedia articles. Readers with Google Earth can click on the coordinates in some of these articles, then click on "Find this location" with Google Earth. Some updates to this page were added on 13 March 2009, but most of it was researched and written in 2007 or earlier. If any reader finds more recent imagery or terrain updates that are relevant to this page, please tell me! General Update 13 March 2009. Many other products have appeared recently, including some that claim to be able to generate panoramas on mobile phones. This is quite an exciting new development, but at present these tend to be limited in their range, their designers seem to be insufficiently aware or concerned about the extent of the gaps in SRTM mountain data, and for much of the world, accurate summit database material is inadequate. But these issues are being addressed, and I am sure that soon it will be possible to use a mobile phone to identify all "those mountains and hills in the distance". Aster DEM data (several updates following the October 2011 following release of version 2). The updates are ongoing as more new tiles are examined. SRTM data can be downloaded from Earth Explorer. Registration is required for download. Since 2014 NASA have been extending the range of their published 1" SRTM data, and it now covers about 90% of the area covered by the original SRTM 3" data. Some of the original no data areas have been filled. The quality of the void fill is variable, but appears to be particularly good in some mountain ranges, including the western Karakoram area and much of High Asia generally. Many large desert voids have also been fixed. In these areas, they have created better data than can currently be found here, and welcome new ground is broken. But the SRTM voids around Mount Everest and the Swiss/Italian Matterhorn still remain. Other Issues with SRTM data that are not addressed by the new data include lack of coverage of polar regions and the inability of the radar to penetrate forestry and buildings. There are also pervasive pits and bumps, albeit with lower amplitudes than ASTER GDEM, for most of these artifacts the height range is about 5-10 metres from the bottom of the pits to the tops of the bumps. These are much more evident in 1" data than 3" data. The nominal resolution of 1" SRTM data, i.e. distance between the posted values, is about 30 metres. The effective resolution is about 50 metres (compare with about 100 metres for Aster GDEM). The display of topographic features is significantly clearer in 1" data than 3" data, but the above mentioned bumps and pits ensure that, as in Aster GDEM, much of the apparent extra detail is artificial. NASA claims a root mean square deviation of 6 metres from ground truth. This is good, but not good enough for coastal areas threatened by global warming. Many areas are shown as being below sea mean level which are shown by local topographic mapping to be above mean sea level. I think Intermap, who supply commercial DEM data, have tried to improve this using NSIDC ground truth data, but I have not seen any of their results. I may attempt something similar. It is my intention to use these new data as the basis for new 1" data on this site. Of course, as most of the data on this site is copied from SRTM, some of the above mentioned issues apply to the data on this site too. For much of the world, this is a good product. It is global, and its images have been accurately placed. and, most important of all, it is free. It can be downloaded directly from here. The primary source of imagery has a resolution of 15 metres and is from NASA's global Landsat program. For some areas, including most of the USA, many cities, and mountains including Mount Everest and most other Nepalese mountains over 8000m, there are higher resolution images. 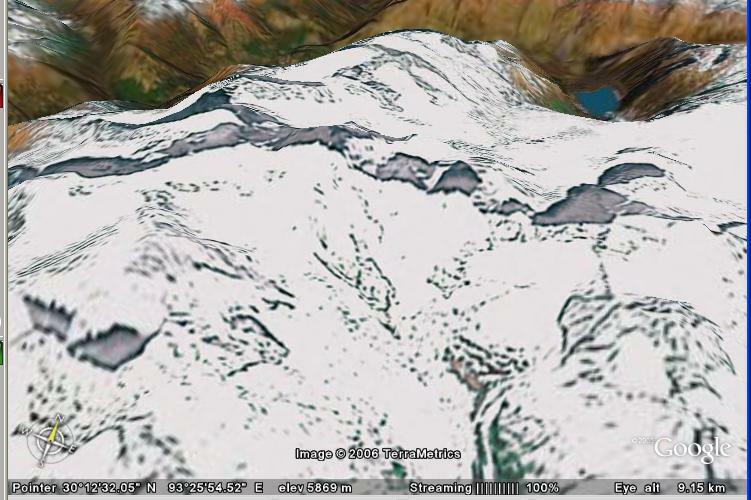 Google Earth images can be tilted to give realistic three dimensional views. But these views require DEM data. Prior to 23 November 2006, the only sources of DEM data that they were using were USGS, GTOPO30 and SRTM. The USGS source is good but only covers US territory. The quality of GTOPO30 is variable and its resolution of 30 arc seconds is not adequate. The quality of SRTM is almost uniformly good and its 3 arc second resolution is adequate, but it mapped nothing north of 60�N or south of 56�S, and missed many areas of very high relief. 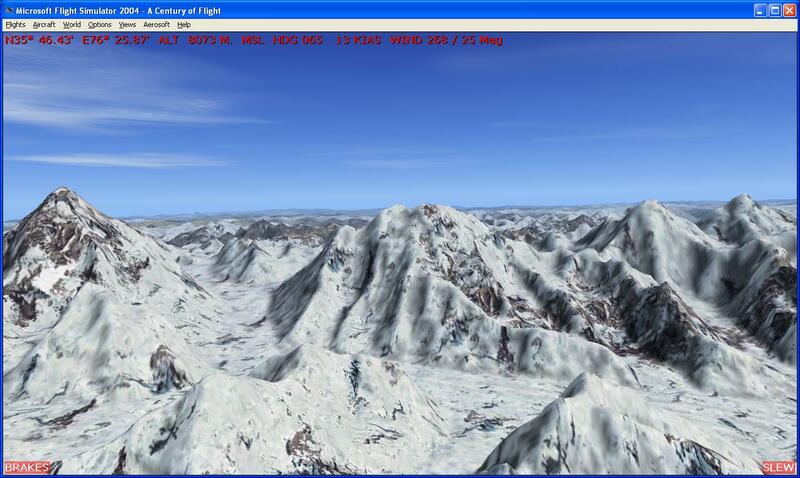 This spoiled the 3D images of thousands of mountains, including Matterhorn and Everest. However, GE have now incorporated DEM data from alternative sources, and the majority of mountains are now much better. See the Ogle Earth pages posted on October 18 and November 23. But there are still issues. Surprisingly, the 3D images of Canada are still GTOPO30/SRTM, despite freely available data from the Canadian government. Many mountains in Western Canada are adversely affected; Monarch mountain is a prominent example. Also, when GE made the above mentioned November 2006 terrain update, they placed the new elevation data 3 arc seconds (one pixel, about 90 metres) too far north. This can be verified by homing on on water bodies surrounded by slopes (e.g. Norwegian fjords) and moving the cursor slowly in a north-south direction. Where Landsat imagery has been used, the effects are not seriously noticeable, but where higher resolution images have been used, dark shadows appear along steep strips which the 3D images show to be the upper parts of south facing slopes, but which in reality are on the north facing sides of narrow ridges. See Everest, especially its north east ridge. There are also occasional issues related to the accurate placement of these high resolution images. Most are well placed but there are exceptions. The image covering Annapurna I has been placed about 10" too far north and 8" too far east. This spoils the close-up 3D view. To verify that the main issue here is image (not DEM) displacement, move along the ridges to the east and south, to where the hi-res image merges with the surrounding Landsat imagery, and note the relative discrepancies. If, as I hope they will, especially following their acquisition of Endoxon, GE incorporate more hi-res imagery, then I think that they need to fix these issues. Insertion 6 April 2009. The 3" displacement problem was fixed in 2008, with pleasing results. On rechecking the Himalaya in March 2012 I was pleased to find that the image displacement issue appears to have been fixed. For the future, it would be nice to see an option to reduce the angle of the field of view but increase the magnification. This would permit the identification of features of long distance views, providing a kind of dynamic version of my panoramas page. For this, it would be necessary to allow for the curvature of the earth. I do not know if GE or WW do this at present, but if not, there may be an adverse effect on response time. Update 2 March 2007. While I welcome the addition of Swiss 50cm imagery and 10m terrain, I am very disappointed to note several flagship mountain summit errors. Here are two screenshots; the first is of the Dom, whose 4545m summit had been reduced to a flat plateau that gets no higher than 4440m. The second is of the Matterhorn, which shows a summit ridge that is too long and with spurious summits at either end. The Italian and Swiss summits should be closer together than these, with a slight drop in between, along a steep ridge, not a flat area. The view is from the south and shows overhanging shadows, showing that there is still terrain/imagery misalignment. There are several other summit inaccuracies in this area, including Weisshorn. There is also an issue around T�di (46�49'N 8�55'), where an area rising to 3614m has been flattened to a 3516m plateau. Most other parts of Switzerland that I have checked seem to be OK, although I do not find significant improvements over the Swiss 1" data here. Update 13 March 2009. Some time ago Google Earth improved their terrain coverage of Canada and Antarctica from the best available sources, and in December 2008 Google Earth corrected the 3" terrain misplacement and extended their use of auxiliary sources, with pleasing results, but they also accidentally withdrew their auxiliary sources from the non-Swiss Alps and Andes, completely destroying several Dolomite Alps and Patagonian Andes. Fortunately these auxiliary sources have since been restored and these areas are now also looking good. The Dom and Matterhorn (see above) have still to be corrected, and the high resolution images of some of the Himalaya are still misplaced over SRTM void areas, but there are now considerably fewer poorly mapped mountain areas left in Google Earth. There are still some poorly placed mountain summit names, with no ASL or relative elevations to accompany them, but I am informed that Google are well on the way to adding these too. Footnote: Google's imagery of my home area is now much better. * I find that the WW controls are less user friendly than those of GE, and tend to respond slower, although I am open to suggestions re how I might better use them. * There are fewer, if any, high resolution mountain images on WW. * WW's underlying DEM has, like that of GE, been upgraded from alternative sources (to "SRTM+"). But the upgrade took place on 20 April 2006, and as far as I am aware there have been no upgrades since. Consequently, at that time of writing (26 December), the extent of WW's accurate DEM coverage is lagging behind GE. But most well known mountains are still covered, and there does not appear to be the 3" displacement that there is in GE. There are still some overhanging shadows, due to the variable quality of the alternative sources in some areas, and the greater contrast of WW tends sometimes to show them up more, but they are narrower, and they are not amplified by the high resolution imagery that GE has. But note that, to the best of my knowledge, SRTM+ only works with versions 1.3.4 or more recent; users who have not downloaded WW updates since April may get the old and woeful 3D mountain images. * WW's software is open source, a fact that NASA make much of. I agree strongly with open source policy. But as I am not into the languages they use, and only a small number of users are into digging into the structure of the software, the benefits seem to me to be more limited that NASA imply. * When I tilt the WW images, there seem to be issues with the accuracy of the information displayed. The positions of the latitude and longitude grid lines appear to move, and to obtain accurate coordinates I need to move the image rather than the cursor. I would also prefer to see the coordinates in DMS format rather than decimal degrees, but I cannot figure out how to get this. 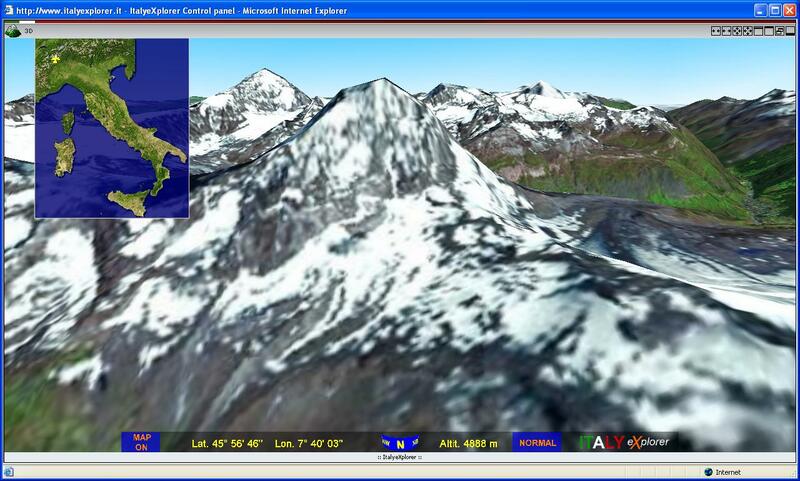 Microsoft Virtual Earth is another earth viewing service which is provided free to the world community. It can be downloaded via Live Search. Here are the main differences between VE and Google Earth. * VE has a facility which allows tilting and rotating using the mouse with the control key depressed. This is a significant improvement; I find this facility to be user friendly. * Comparing the extent of high resolution imagery, for much of Europe, VE seems to have a significant lead, see Lochmill. For Europe, VE also has better coloring, although when I checked Colorado I found VE had greyscale images. 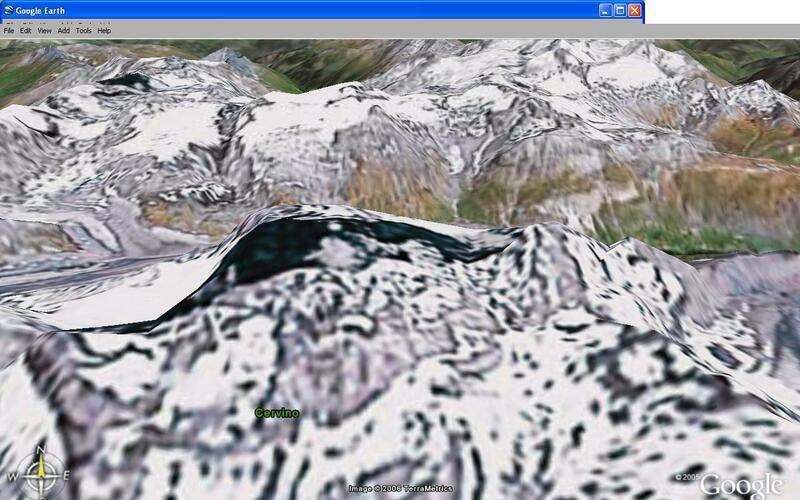 In the Himalayas, Google Earth leads in the hi-res image department. * For most of the world, VE's underlying terrain model is based on the same NASA SRTM model that is used by GE and WW. But here is the big difference: where there is no SRTM data, VE are still mainly interpolating or using low resolution data. For some parts of Europe, including the Alps, there is evidence of input from another 3" source, but for mountain areas, the quality of this source is not good. A tour of the polar regions (including most of Norway and Sweden) and SRTM mountain blackspots like Matterhorn and Everest continues to shows up mountain eyesores that were, until recently, visible on Google Earth. Yuk. * I don't think there is any open source software. That's not the Microsoft way. * VE has underlying road map coverage, which can be used in conjunction with aerial coverage. This is a great help for finding places. But against that, VE does not display coordinates or terrain heights, at least not as far as I have been able to figure out. While this may not be an issue for the majority of users, it is for me, and I cannot see why this should not at least be made an option. There are other earth viewing services. As far as I am aware, they either do not permit 3D viewing or, if they do, they often use poor quality DEM data, but any reader who thinks I have missed something should tell me. There follows a review Microsoft Flight Simultator, see below, which does not use good default DEM data, but it permits third party add-ons and can be made comparable with the above products. The comments below are generally equally applicable to FS2004 and FSX (which was released in late 2006), although for some areas FSX offers better default terrain mesh data. Microsoft FS, in its basic form, is primarily designed for aircraft pilots and would-be pilots to practice on, and its default scenery and topography, which is based on landclass data rather than images, is poorer than that of GE, NWW and MVE. Its main advantage, however, is that it allows independent developers to create and add on their own scenery meshes. This facility has been taken up, with the use of data downloaded from my DEM page; the aerial view of the Karakoram 8000ers created can be viewed here and compared with the pre-update (see above) Google Earth view. 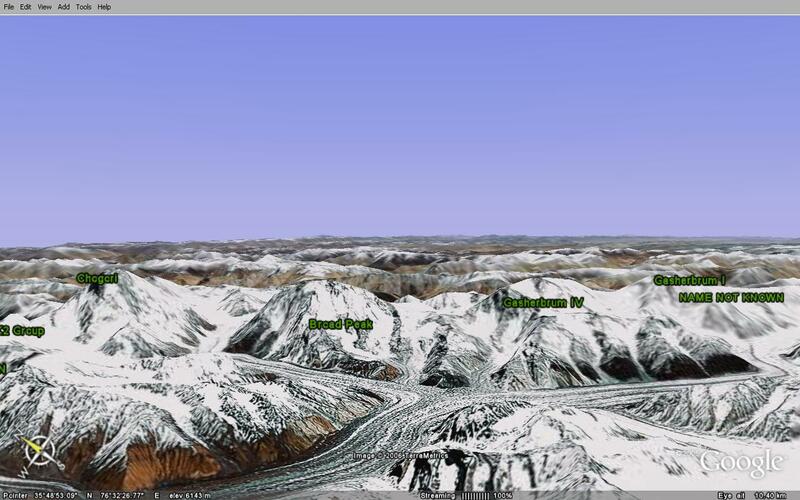 The FS and pre-update GE views of Birutaso, a remote 6691m mountain in eastern Tibet, can be compared with an actual photograph (external link). A problem with some flight simulator meshes is that they only provide elevation data, and this can be inconsistent with Microsoft's default coastline and lakes data, causing false beaches and cliffs. The problem is acute in Norway, but fortunately compatible coastline has been provided by a new product called Ultimate Terrain Europe. Users of accurate Scandinavian mesh data should also download a UT patch to make the lake elevations compatible with that data; otherwise lake towers and pits will spoil the scenery. There is similar problem with the Faeroe islands, which UT Europe does not cover, but a good Faeroes mesh which includes compatible coastline ans many other local features can be downloaded here. I have not been able to figure out how to identify (other than via grid references) the features displayed in FS imagery; this is a serious disadvantage relative to GE/WW. FSX update. I have just carried out more checks on the FSX default mesh. For most of the world, the FSX default mesh is no better than the FS2004 default mesh, but for most of North America, Europe, and a few other areas, the use of SRTM and other high resolution data has brought about a substantial improvement. For Norway and Sweden, where there is no SRTM data north of 60�21", FSX uses accurate meshes which seem to have been created from national survey data. But for most other areas, including most of the Alps, the SRTM no data areas have been filled by crude interpolation. For some screenshot comparisons, see FSGlobal2008. This is another similar product with great potential, although at present it is only available for Italian territory. It can be accessed here. Note that it is check the box above "Avvia ItalyeXplorer" and if necessary download the Blaxxun plug-in (click on "questo file"). The photo-realism is good. Prior to November 23, the 3D accuracy was better than Google Earth but, at the time of writing, limited. 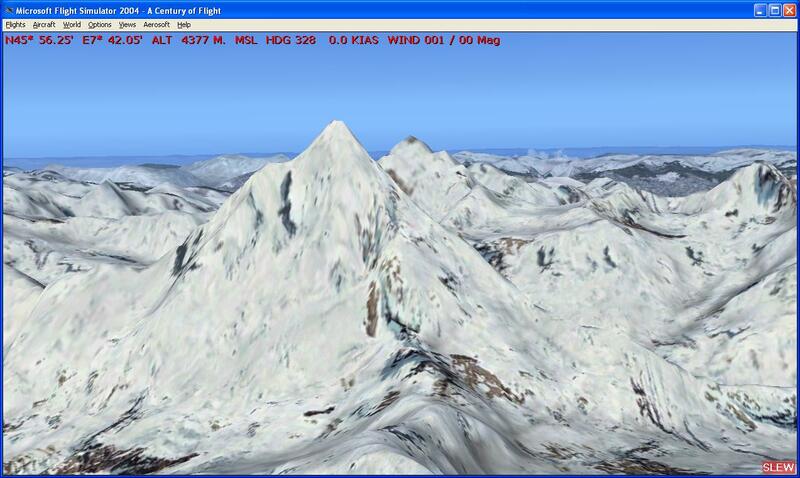 See some Matterhorn screenshot comparisons: pre-update GE(joke), IE, and FS, clearly showing the profile of the western ridge. Update 13 March 2009.My thanks to Andrea Caporin at Italy explorer for informing me that Italy Explorer now includes high quality imagery and terrain of the Dolomites, accessible here. The Dolomite source terrain has a resolution of 1", showing up more detail than the 3" source terrain used by Google Earth and very much more detail that the incomplete and crudely interpolated Dolomite SRTM terrain used by Microsoft Virtual Earth. It is possible to use this to explore the rest of the world, including SRTM and some auxiliary mountain terrain. This auxiliary terrain is at present less extensive than in Google Earth but more extensive than in Microsoft Virtual Earth. Another database from Italy Explorer provides even better coverage of the Rimini area. Another Italian product, from Geomind, gives excellent coverage of Tuscany. Most of this article was written and posted on 3-4 July 2009 following version 1 of the release of the long awaited no cost global ASTER GDEM. Updates in brown are being added following the release of version 2 in October 2011. I would like see the day when there is a complete, free on demand, global and consistent data source with a true (as opposed to nominal) resolution of about 3", with true 1" data for areas of very high relief. I think that GDEM will make a useful contribution to this, the more so following the release of version 2, but I have still not seen that day. 3" SRTM is true 3" data. There are true 1" data for most of North America, and for some European mountain areas (from this site). But the accuracy of the SRTM 3" voidfill on this site is subject to the quality variations of the topographic sources, and is not yet complete. North Eurasia, Greenland and Antarctica are covered by this site also, but Siberia is not complete, and quality is variable. At best GDEM version 1 is a true 3" DEM and its quality is not at all consistent. See a DEM screenshot of part of the southern highlands of Scotland. See also mouse rollover comparisons from Scotland (mixed relief), Mindanao, Philippines (low relief), New Guinea (high relief) and Patagonia (extreme relief). I have been unable to get the Japanese download site to respond to the download button. But I have been able to order some tiles from the US download site. At first there was a delay of a few hours before the download links arrived, but they are now coming through promptly. The links to the validation summary report do not appear to work, but I found the report elsewhere and uploaded it here. While the elevation postings in the ASTER GDEM are at 1 arcsecond, or approximately 30 m, the detail of topographic expression resolvable in the ASTER GDEM appears to be between 100 m and 120 m. Version 2 shows a considerable improvement in the effective level of detail. Highest cells are now closer to peak spot heights. But much of the extra detail appears to be artificial (see next paragraph). Much more troublesome than residual cloud anomalies, however, are a variety of pervasive artifacts that are clearly related to linear and curvilinear boundaries between different stack number areas. Such artifacts appear as straight lines, pits, bumps, mole runs, and other geometric shapes. Anomalous elevations associated with these artifacts can range from 1 m or 2 m to more than 100 m. These artifacts appear to be no less pervasive in Version 2. The additional level of detail (see above) has thrown up many more such artifacts. It followed from these alone that GDEM has still not replaced SRTM as the default source of the hybrid DEM data on his site. Fortunately the effect of these stacking artifacts is inversely proportional to the level of relief, so the effectiveness of GDEM for the filling of high relief SRTM void areas is not unacceptably compromised. The same is not true of cloud anomalies, which must be sought out and removed prior to SRTM void fill, but fortunately these are not too hard to identify. The cloud anomaly incidence in v2 is lower than in v1 but isolated exceptions, which will be highly visible in any 3D rendering application, can still be found in many areas. The existence of most water bodies is not indicated. Many of these are flattened in Version 2, but unflattened water bodies are still a frequent cause of artifacts. Serious coastline errors remain; GDEM hardly has Singapore as a peninsula, let alone the island that it is. METI and NASA acknowledge that Version 1 of the ASTER GDEM should be viewed as experimental or research grade. Version 2 should also be so acknowledged. The last point should not be lost on the flight simulator mesh designers and earth viewing services reviewed on this page. If they use these research grade data, their renditions will be filled with weird artifacts, some of which may be highly visible. All credit to NASA/METI for pointing out what I quickly saw for myself. Despite the nominal 1" resolution, the true resolution is lower than 3" (downsampled from 1") SRTM data, and there are very many pits, bumps and mole runs. So far the tallest spike that I have found is 3,844 metres, at N 60�43' E 22�02', in south west Finland, and the deepest pit is about 3,000 metres, in tile N27E088, containing cells below 5,300m close to where Kangchenjunga's main summit ridge should rise to 8586m. Generally, artifacts are visible in almost all areas of low relief. Coastlines are not at all accurate; lakes have not been flattened and are particularly badly affected by artifacts. Major errors can be found in most areas of very high relief, But in between, some areas of medium to high relief have been well done and are almost artifact free. My early impression is that, for areas where topographic coverage is poor, these data could be separated out for use to improve DEM data, including both mountain and desert voidfill data, on this and other sites. At one time I thought it may also be possible to flatten the low relief artifacts to provide data that will improve coverage of the plains of North Eurasia, but after further consideration I doubt that this will be possible. The files contain quality assessment (QA) metadata indicating the number of scenes that have contributed to each cell. This is a useful guide to data quality, but even where it is low, I have found some good data in areas of medium-high relief. In some areas, these show that the best GDEM data are not from ASTER. Where they have a value of -1, they indicate replacement of anomalous ASTER data with data from the so-called "SRTM3 V3", and quality of some of this appears to be high. See some photographic comparisons of Nanda Devi, Indian Himalaya. V3 has not yet been released generally and contains, to the best of my knowledge, supplementary SRTM voidfill material supplied by NGA (i.e. the US military). The ultimate source of this material seems to be known only to NGA and is probably not available to the general public. It looks too accurate to be TPC or JOG topos. This V3 data, which should not be confused with CGIAR data, only appears in some tiles. Other tiles use V2 data, which are no use where they are void, or NED/CDED data. No replacement data has been used in North Eurasia. Moreover, the detection accuracy of anomalous ASTER data has not always been accurate, so they are liable to appear in all tiles. Generally, I see evidence that some effort has been made to remove artificial spikes and bumps from GDEM mountain data. This reduces their visual impact, but they have not been removed globally, are still often found in the shadows of mountain ranges, and affected summits and ridges have often been replaced by artificial breaches. The Matterhorn appears to be seriously affected in this way. While accepting that many of these data do meet the 20m with 95% confidence claims, the claims do not tell the whole story. If a tile loses mountain summits and ridges and gains about 20 spikes ranging from 100m to 1000m, as very many, perhaps even a majority (outwith CONUS) do, there is no effect on the true 95% CI figure and little effect on the RMS error. But the effect on renditions will be highly visible. A unsightly bump/pit pair, simultaneously creating 40m/0m elevations on 20m plain, will also not affect the claim. SRTM data is generally free of these, but they seem to affect all plains in GDEM. Some large stretches of GDEM data for monotonous North Eurasian taiga and tundra are almost completely covered by these, and their size exceeds +/-20m so the 20m/95%CI test fails. Glaciers also have these artifacts. On the icefields the situation is often even worse, although efforts appear to have been made to flatten parts of them. Annoyingly, the flat slacks that separate desert sand dunes are also affected; this will obstruct my planned use of GDEM to fix the SRTM desert voids. The next step may be release to the public of a new official SRTM product with voidfill supplied by NGA. I have heard that such a product is rumoured to be released soon, but as far as I know, no hard information has been made available. Alternatively, the next step may come from the French Spot DEM project, which is applying higher resolution stereo source imagery. Or it may be the German TANDEM-X satellite, which following launch in October will apply interferometry in tandem with the DLR's existing TerraSAR-X satellite. Or it may be Intermap, who are mapping the world using high resolution interferometry. Unfortunately these projects are whole or part privately funded by institutions that will expect returns. But they may offer some help. The pricing of DEM data in euros per square kilometre is not the way forward, although it will not bother me if it continues for small quantities of very high resolution local data beyond the true 3" / high relief true 1" specifications mentionead at the top of this review. N57W007, Island of Skye, Scotland. This tile breaks no new ground over existing data that is available. It is full of highly visible bumps and pits, and there are several false and missing islands; one missing island covers about 30 hectares and rises to nearly 100m. The entire area is better covered by SRTM based data. But the steep Black Cuillin ridge was generally artifact free, and could be used for SRTM voidfill by anyone not wishing to use topographic sources. This ridge has been accurately mapped at 1:12,500. I have compared the summit and col heights given by various DEMs with their actual heights. Most GDEM heights are at least 50m lower but none are more than 80m lower, representing a considerable improvement on earlier ASTER data for similar ridges. Elsewhere in Scotland, I found a 3,000 metre spike at N 56�56' W 3�58'. Version 2: there is an overall improvement on v1, but there are still too many artifacts, including new artifacts more than 100 metres high that are not in v1. Coastline and other water bodies have been improved but still fall far short of SRTM. Therefore I still do not recommend the use of this tile by earth viewing services or flight simulator mesh designers. Footnote, March 2012. I have just downloaded all the GDEM data for the United Kingdom. I need not have bothered. N45-46,E005-014. Alps. Seeing the 4478m Matterhorn (N 45�58' E 7�39') reduced to a crater with a rim rising no higher than 3850m, and crater cells dropping below 3400m, I wondered if these tiles merited further examination. There are also major errors in the Dolomites and the NE ridge of the Eiger has been almost completely wiped out. It was not all quite that bad, coverage of most 4000ers is fair but there are not the detail and vertical accuracy of the 1" DEM data on this site. I checked out some low relief areas also. There is a clearly visible 100m bump+pit at 45�02' 7�51'. Less clear were a series of false 30m ridges around 45�15' 7�55'. Similar artifacts, devoid of any ground truth basis, appear in many other places. The 564m Brienzer See is not flattened and its median GDEM elevation appears to be 672m. In version 2, the Matterhorn stands more upright but a north-south slice, which includes the summit area, is missing, creating a West and an East Matterhorn. There is some noticeable improvement in the high relief areas, but many ridge sections are still missing. Moreover, claims that GDEM issues in central Europe are confined to areas of extreme relief do not stand up to examination of the unflattened Schwarzwald Schluchsee, and comparison with detailed topographic maps still show consistently better agreement with SRTM data. N35-36 E074-77, Karakoram and Hindu Kush. GDEM have generally done this remarkably well. Peak heights generally match SRTM data well, and match other sources where SRTM data are void. There are some deep pits around the highest summits, and a few artificial (up to about 250m high) bridges across gorges, but most (not all) of the actual summits and ridges are OK. But much of the credit must go to non-ASTER V3 data (see above). N33E076, Indian Himalaya. Similar to Karakoram, see above. Topographic mapping available to the public is very poor in the Indian Himalaya, so tiles of this quality here break ground not already broken by my site. N30E093-4, East Tibet. This is an interesting pair, because it illustrates the difference between the use of V3 and V2 as replacement data (see above). Both have very high void incidence in V2. Here a DEM screenshot. Left of the white line, N30E093, which has been created using V3 replacement data, is almost good enough to fill the SRTM voids using a very simple algorithm. Right of the line, in N30E094, only V2 has been used, any many tall artifacts remain. This effect is less noticeable between N45E006 and N44E006 because of the higher source scene stacks and lower SRTMv2 void incidence. In Version 2 N30E094 is considerably worse than in Version 1. N27E086,E087,E088. East Nepal. Some reviewers may check out Mount Everest and its South Col and jump for joy. Yes, these appear to be correct but little or no new ground is broken over the data on this site. I have already mentioned the 3000m Kangchenjunga pit. Another affects Makalu. Nearby 8516m Lhotse rises to less than 8350m, and east of Lhotse a false 7,500m pass coincides with the true location of Lhotse Shar (8384m). Checking Ama Dablam at 27�52' 86�52', I saw nothing over 6440m and there is a false 6200m pass where its 6816m true summit is located. There were other similar incidences. I also found some high bridges across gorges; the highest was 400m. This area is considerably better in Version 2, but there are still some major issues. Footnote, March 2012. There really is much useful GDEM data for High Asia. The Tibet plateau is poor, and areas of extreme relief (including most of the 8000ers) contain major errors, but the data fit into the majority of SRTM mountain voids remarkably well, especially in the western part. 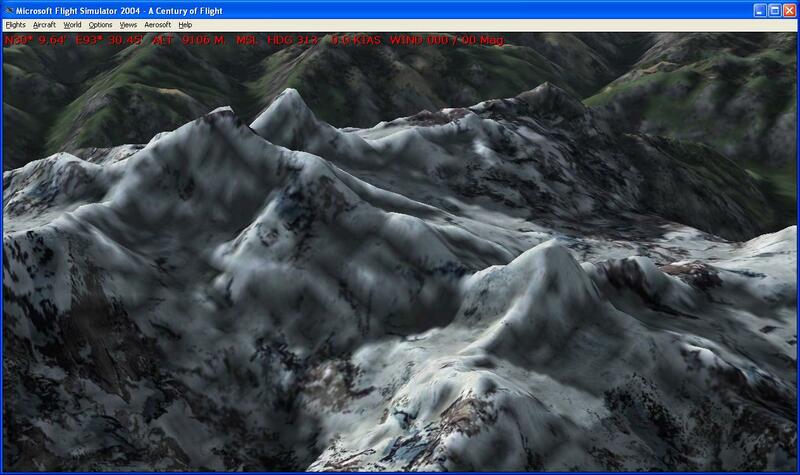 In some mountain areas better results may be available from pure GDEM. N68W030/S79W086 Highest areas of Greenland and Antarctica. These tiles contains Greenland/Antarctica's highest summits, which have been well done, at least as well as in the Greenland data on this site, and they break new ground in Antarctica. Input from non-Aster sources is not evident from the QA data but seems quite likely to have been applied in post-processing. Around and apart from the summit areas there are some ridge breaking pits, and there are pits in the glaciers that surely cannot be explained by crevasses, but most of this tile looks OK. Lithospheric coastline is not mapped; a surrounding 2km ice shelf, about 5m high, is shown. Most of the icefields are very poor, but efforts appear to have been made to flatten parts of them. N75E112-13, N61E064, Siberia. These are poor tiles. There is very little reliable material to make up for the above mentioned 3000m spikes. Coastline is particularly poor, and even the better mapped valleys are crossed by false bridges and depressions. North Siberia is now fully covered by DEM data on this site, but for most areas the use of anything more detailed than 200K topos was not within my resources. Consequently, GDEM may show some correct extra detail that is not shown in the data on this site, but all areas appear to be infested with pervasive artifacts. These artifacts degrade GDEM most in low relief areas. Higher relief areas tend to be better, and most mountain ridges are likely to be more accurately positioned in GDEM than in the data on this site. Patagonia. I have now completed a DEM of this area, with the help of much good GDEM data, especially north of 48� of latitude. Further south there are many several thousand metre high cloud spikes, and GDEM fails in areas of extreme relief, e.g. the Torres del Paine. N05W063-W061, South American Orinoco (Venezuela/Brazil/Guyana). These are no use. There is nothing accurate here over and above SRTM, and major cloud anomalies are retained. Even when cloud breaks permit, I do not see how it will ever be possible to map this sort of terrain from 14m resolution imagery or even from high resolution imagery. Interferometry, not stereo photogrammetry, is the solution to these areas. Is it possible that Intermap could be persuaded to address this area? I know they are commercial, but they could perhaps release some downsampled contributions to GEOSS. Other Sources. Although this site is primarily for users of free data, commercial data, with the prices to match, may be of interest. A forthcoming Global DEM, claimed to be free from SRTM voids and Aster GDEM anomalies, has been announced by Intermap Technologies. Its free data sources are similar to the DEM data on this site so from a distance it should look quite similar. I cannot comment in any close-up detail on its quality as I have seen none of it. It uses advanced processing techniques that have not so far been used in the production of data on this site, but I would question the validity of its "World 30" title as its base source is, like most of the DEM data on this site, 90m SRTM data, and the effective resolution of Aster GDEM is little or no better. Its price is claimed to be "as low as one cent per square kilometre" and that "150 million square kilometres will be available at the click of a mouse". World "30" may be welcomed by public authorities and large corporations with $1.5 million to spend, who tend to be sceptical of free data. I am disappointed that this site may not, after all, be the first to host a complete, worldwide DEM without voids or serious artifacts, but companies like Intermap do not really compete with this site as few of its users have the means to buy from them.